Founded in 1989, Youngberg Hill aspires to create the very best wine from the grapes grown in each vintage. We focus our attention on growing the highest quality of grapes possible, and then managing the fruit through the fermentation process. By limiting yields and restraining barrel treatment, we are able to produce fine wines that give a pure expression of our beautiful vineyard and its terroir. Wine is a wonderful gift from nature, and its qualities vary according to the year and all of the different elements in a vine’s growing environment. The French term which describes this concept is terroir – meaning not just the soil, but also the rainfall, drainage, exposure and climate specific to a given site. The journey of a vine through its growth cycle, within its specific terroir, is an amazing thing: the vine sends its roots deep into the living earth. It struggles in search of water and nutrients, in communion with the unseen but vital world of soil microbes. Above the ground, the vineyard teems with life. A large community of grasses, herbs, and wildflowers supports a complex array of insect life, and the vine, with its verdant canopy, sends out its flowers and produces a crop of grapes. During the warm days of summer the grapes soak up the sun and ripen. When the seasons begin to change and autumn is arriving, it is time to begin the harvest, not too soon and not too late. The soils are complemented by distinct weather here in the coastal foot hills. Located only 25 miles from the ocean, the coast range provides a shadow for the weather coming from the coast. We receive great precipitation, long sunny days in the summer, cooler day temperatures, coastal breezes every afternoon, and cooler night temperatures. All of these elements are excellent for growing Pinot Noir and enable us to produce extremely high quality fruit with rich, intense black fruit flavors, earthy minerality, and high acidity, adding both structure and complexity to our wines. We practice organic and biodynamic farming here at Youngberg Hill without the use of irrigation. Some of our current sustainable practices include reducing soil erosion through the planting of beneficial cover crops, employing safe, controlled spraying use of such biodegradable oils, organic teas, and whey; and supporting balance of all life forms on The Hill. Youngberg Hill has been aggressively pursuing the goal of 100% sustainability in our vineyards. In 2005, we earned third party sustainable certifications for LIVE (liveinc.org) and Salmon Safe (salmonsafe.org), and in 2010 we were certified “Sustainable” by the Oregon Wine Board. We invite you to join us from 10am to 4pm daily at Youngberg Hill. Beautiful view, friendly staff, and good wine made for the best wine tasting on our McMinnville adventure. 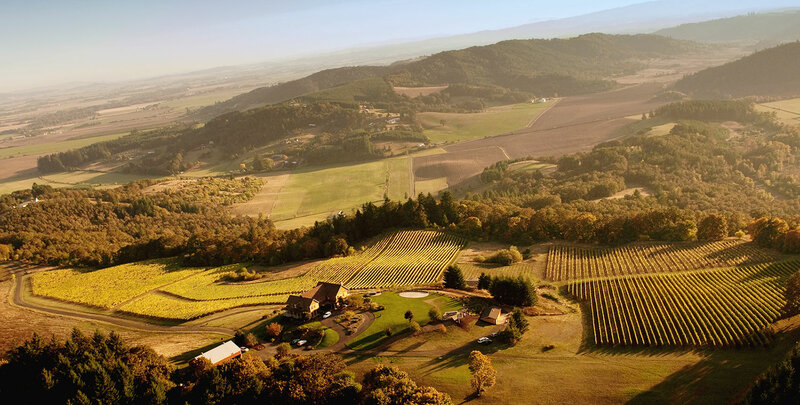 This winery is tucked away in the hills of breathtaking Oregon Wine Country and is definitely a gem worth exploring. We visited numerous wineries in the area during our stay and I can say in all honesty that Youngberg's "Cuvee" pinot was the best pinot that we tried on the entire trip. Really good stuff. The best Willamette has to offer... Some of the nicest folks we have met. Youngberg Hill sits directly above a vineyard and has stunning views of the valley. Great location, wonderful view and lovely people. There was nothing to not like about our time at Youngberg Hill.